Baking rocks for the Holidays is a tradition in our family. The name “Rocks” sounds kind of iffy. But trust me, they are delicious. Liz had never had them before. I turned off the computer, turned up the Christmas music, and convinced her to bake up a batch to take to Solstice. 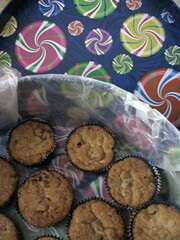 I was the right-hand cook, chopping dates, locating the buried hand mixer, digging out the muffin tins, stealing tasty swipes of raw batter while Liz rolled together the ingredients. Mom sent me the recipe a few weeks ago, adding all the little tips and tidbits Aunt Cassie passed down to her. Recipes weren’t written down in the past. They were passed from mother to daughter by story and word of mouth. 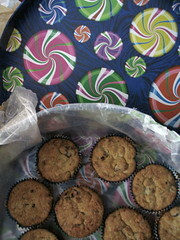 (When I called to ask my sister the baking time for smaller muffin tins, she was making Rocks, too! And was only a few steps behind Liz in the mixing.) Now recipes are passed on to fathers and sons. My brothers are as apt to bake as I am. I searched high and low for the history of Rocks. I came up empty. They seem similar to the Rock Cakes that originated in England (and are featured in one of the Harry Potter books). 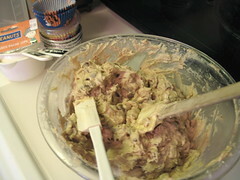 The batter has some of the same ingredients. But, no, they’re not Rock Cakes. Rocks are not cupcakes, cookies, or cake. They aren’t fruit cake either. They seem to be a variation of all of these recipes. I am sure they are Southern. But when I was surprised by a call from my Aunt Annette in South Carolina this morning, and told her I was making Rocks, she said, “What, Honey? Rocks?” She had never heard of Rocks in her family. That caused me to scratch my head since I thought they were well known and widespread across the South. If anyone knows the history of Rocks, please feel free to chime in in the comments. Meantime, I’ll keep my eyes open and continue to research as I write my memoir. There was another little surprise today. While I was working on this post tonight and watching the Vikings play the Redskins, my brother called from Pennsylvania to say they had just taken a family portrait and I was included. Same sentiments when the phone passed to my other brother, step-dad, and sister-in-law. There was laughter all around. Stay tuned. And now, Amelia’s Rock recipe. Southern style. Then gradually add eggs, one at a time, beating well after each one. Gradually add flour and spice mix. Mix soda in sour milk (or warm water). Fold into mixture, just until combined. Stir in nuts and dates to coat all the pieces. 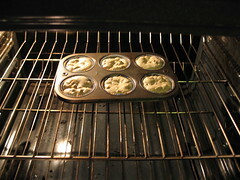 Fill cupcake pans 2/3 full. Bake in oven preheated to 350 degrees for about 25 mins (or until toothpick comes out clean). Rocks keep well and are better after the second day. Keep in covered container (you can also wrap in cloth towel). If they become too dry, add a slice of bread, broken up, to the container. They will absorb moisture from bread. My recipes were written by Aunt Cassie and didn’t have any directions. We were suppose to know all the extras, so I wrote them in for you. Mixing really well makes a difference with a lot of cakes. That’s Mom’s recipe for Rocks. I like them warm. Right out of the oven. But the best part of baking Rocks? Rocks smell like home. QM, this is a fun food post. I’d never heard about rocks before reading this. “Rocks” is such a wild thing to name a baked good, because, well, the last thing you’d want your baked delight to turn into is rocks. But here they are, in all their hard glory! Were they a hit at the party? Any broken teeth 8) ? Truly, they do sound delicious. p.s., I learned the slice of bread trick from Jim. He adds one to our brown sugar whenever we accidentally leave the ziploc open and dry it out. Interestingly, he has a lot of little tricks like that that he picked up from his mom and two grandmothers. QM, I remember rocks being something passed down from Grandma in East Berlin. I didn’t think they were a southern recipe – you might have more luck doing your research from the North or even Pennsylvania Dutch venue. Needless to say what the origin, it’s one of our family traditions that I am not allowed to come to our Christmas dinner without! 2 batches for one sitting – and very rarely do I have any left to take home. I like to think they are called rocks because if you don’t put that piece of bread (or a few pieces of sliced apple, as I do) into the container holding the rocks – they will get as hard as a rock in a few days when the dates dry out. That’s never been a problem in our family because they never last that long! Happy eating . . .
ybonesy, the Rocks were a huge hit at the party. Nope, no broken teeth this time around! 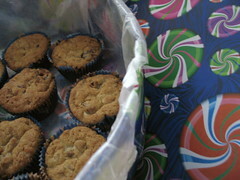 And I have to say, I’ve eaten about 2 a day since we baked them! There is only one rock left in the colorful bin and I think I might polish it off today. I have to make them more often. 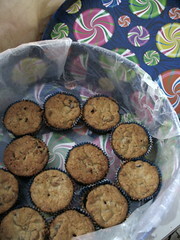 I don’t know what it is about them, but I just love the combination: the taste of the batter with the nuts and dates. HMMMM. gritsinpa, my goodness, I think Aunt Cassie would be turning in her grave to hear you say Rocks might be from the North! But you bring up a good point – I need to do more research from both parts of the country to find out their origins. Mom said she got this particular Rock recipe from Aunt Cassie in Georgia. I don’t remember Grandma in East Berlin making them. But she could have. Hey, remember when we lived with them for a while in East Berlin? You were pretty young then but I remember how spooky it was in that old farmhouse at night. There were bats in the belfry (attic). Remember when that bat came down to our bedroom door and scared the crap out of me? I jumped out of bed and ran, then stepped on what I thought was a bat – it was only your flip-flop! Whew! I’d like to drive by that place again sometime. Maybe we can do that next time I am home in PA.
Our Rocks didn’t have time to get hard either. We ate them too fast. But I wonder if that is where they got their name? From how hard they get without the “adding bread to the box” trick. I’ll keep researching and see what I come up with. Grits in Pa, I don’t remember Hilda making rocks. But I had sent Janette the recipe before we moved up here. It was a joke in one of our letters when she asked me what rocks were, did they come from the yard? Maybe she got the recipe from her. In some recipe books I have noticed a recipe for rock cookies, not the same though. QM the nuts and dates are the next to last thing mixed. The baking soda mixed in the warm water or buttermilk stirred in last. But if it works do it either way. Mom, thanks for the correction! I’ll go up and update the recipe in the post. I’m pretty sure we did it in the reverse and I’ve nearly gobbled up every one! But there’s a reason that things are mixed in a certain order. So I want the recipe to be as you make them. Thanks! By the way, I saw a few recipes on the Internet for the Rock Cookies you mention, too. They are English and look like a cookie. Sometimes the Rock Cookies have fruit like in Fruit Cake. So I’m with you all the way – Rock Cookies aren’t our Rocks at all! I’m almost ready to make another batch of Rocks New Year’s week. Just the smell of them baking is worth it. Okay, I corrected the Mix: section, and changed the nuts and dates to be mixed right before the baking soda (in sour milk or warm water). And the flour and spices after the eggs. I’ll have to correct the recipe Liz typed and printed up for us to have around the house, too! BTW, I see by that photograph of the baking Rocks that we need to clean our oven! All this baking has created quite a mess! I’m adding that to our list. Love the tablecloth. What a cheerful kitchen you must have. Alas, my hands are sticky from cutting dates and mixing the eggs into the butter and sugar, one by one! I talked Liz into making yet another batch of Rocks today. YUM. We’ve got the Christmas music going and are in the last stages before loading the first batch into the oven. There is egg nog in hand. It’s gently snowing outside and I still feel the Holiday Spirit. Mom, wanted to let you know that Liz caught the mistake in the recipe the first time she made them and had corrected it, adding the flour before the nuts and dates! I had just forgotten to make the correction on red Ravine. So I’m glad you read this again and also caught it so I could correct it! Oh, and this time we used Certified Organic Pitted Deglett dates from the Wedge Co-Op in Minneapolis. We shopped there last night and those are the only ones they had. They look a little lighter than the Dromedaries. I’ll let you know how they come out. Can’t wait to have another warm Rock from the oven in about 20 minutes. I’m off to help fill the muffin tins. It feels like New Year’s Eve today. Warm and wintry. Happy Holidays. Gearing up to make Rocks this weekend! Can’t wait to eat some of the batter!